I had a flashback on Tuesday morning. Seeing the K-1 class with teachers and parents waiting at the bus stop on 40th Street, brought me back to the earliest years of the Seed when we had only a handful of young children. It was the late 70s, and the father of one of our students was a hotel manager in downtown Phoenix. We were in the midst of a transportation study and decided what better way to understand how people in a city get around than to ride on the city bus? 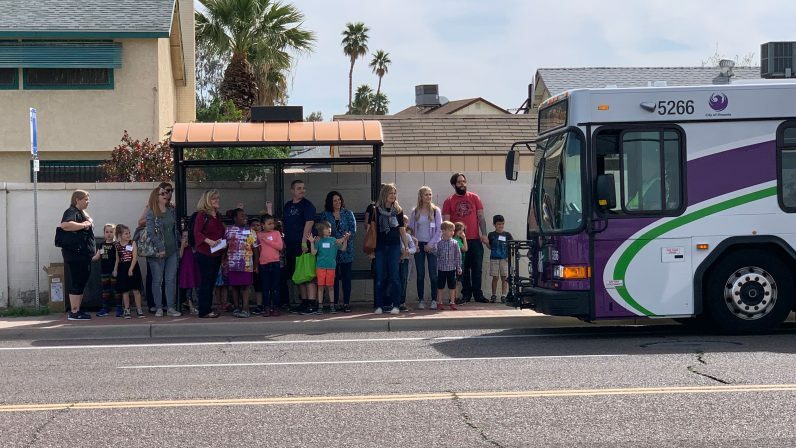 We loaded up our tiny group of preschoolers, hopped on a Tempe bus, and rode it into Phoenix. After a completely exciting visit to the hotel, we boarded the bus again and headed back to school. Although the kids enjoyed exploring the hotel, the bus ride was infinitely more memorable. When our current K-1 teacher approached us about the idea of taking the city bus and light rail downtown for a performance, I was all for it. While the intention of doing so was to ease the expense and complexity of downtown parking, I was delighted for the class to experience such an adventure. Using public transportation has always been one of my favorite parts of going to places like New York City and Washington, D. C. I am grateful I have a nice car that I can drive around Phoenix anywhere I want. It’s convenient and comfortable. Yet I also think it’s important to experience how people who don’t have their own cars move about the city. It fosters empathy and understanding. And, in many ways, it helps build connection. In India recently, I had a similar experience. We traveled from city to city several times by train. It would have been easier to fly, which we did a few times, but we also wanted to experience India by train. Our intention was to see more of the countryside and to be among everyday people moving from place to place. We saw families getting on and off the trains with heavy bundles and young children. As we waited for our trains, we stood beside beautifully wrinkled old women in their colorful saris selling small items to travelers. From our bunk beds on the overnight trains, we heard vendors passing through the cars selling food and hot chai. At dawn we saw farmers working their fields in the early morning mists. The images of life along the train tracks still linger in my memory weeks after I’ve returned home. Our times in and around the trains most definitely deepened my connection to the heart of India. Their trip on the bus and light rail certainly enhanced our K-1 students’ connections to the city in which we live. It showed them alternative ways of transportation, especially important for people who don’t have a car. When I stopped by their classroom to ask a few questions about their experience, one child shouted out, “Are we going to be on the news?” I asked what happened that was newsworthy. After a few ideas, one girl suggested, “Going on the bus. It was the first time for some of us, and it would be cool to have it on TV.” Their story didn’t make the evening news, but I’m certain it will remain a vivid memory for years to come as they are transported through their lives.